SynaptiCAD has released an updated version of WaveViewer, a free viewer for digital and analog waveforms. 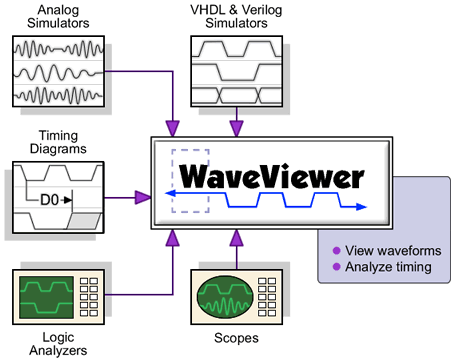 Waveform formats supported by WaveViewer include VCD/EVCD, SPICE CSDF/TRN, Synopsys TimeMill, Agilent and Tektronix logic analyzer data and mixed-signal oscilloscope data, SynaptiCAD's compressed binary format (BTIM), and many other common formats produced by EDA tools. The viewer also supports color syntax highlighted editing for VHDL, Verilog, and C/C++ code. The new version of WaveViewer is primarily a performance-enhancement release. Waveform compression has been improved, in some cases as much as 5x over previous versions, which translates into reduced memory requirements to load large waveform files. Compressed files load and save from 3 to 15 times faster than previously. Waveform rendering time was also improved, allowing even truly huge files (e.g. files with over 1,000,000 signals with gigabytes of waveform data) to be rapidly scrolled. In addition, the Windows version can now access up to 3GB of operating system memory (previously the Windows version was limited to 2GB).